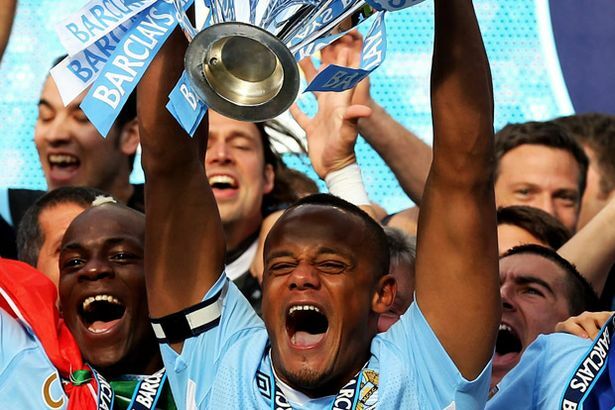 The Premier League’s relentless publicity machine had already given the award for Best Season to the 2011/12 campaign for its “mix of wonderfully memorable matches, unbelievable drama and continuing excitement at both ends of the table”, but Aguero’s spectacular flash of inspiration delivered the cherry on the icing on the cake. Scudamore’s revelation that the Premier League would be paid over £1 billion a season from 2013/14 was equally dramatic, leaving most seasoned observers of such deals open-mouthed with astonishment. Even the league’s head honcho was moved to say that he was “as surprised as anyone” that they could achieve such an enormous increase in these recessionary times. 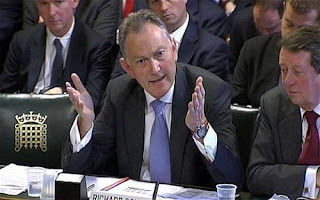 "Scudamore - the deal is this big"
The basic facts of the deal are that Sky and BT have bought the domestic rights for the three years between 2013/14 and 2015/16 in a sealed bids tender. Sky have again retained the lion’s share winning 116 of the 154 matches (the maximum allowed to any broadcaster), but have had to shell out £2.3 billion, a 40% increase on the £1.6 billion they paid last time around. The surprising new kids on the block are BT, who won the rights to 38 matches, around a quarter of the total on offer. They paid £738 million to replace ESPN, who only paid £159 million, though it should be noted that the home of Disney picked up the rights from the failed Setanta and they only covered 23 games. Interestingly, BT also have almost half of the “first pick” games, e.g. those featuring the leading clubs, which is the first time that Sky have not had all of them. So the total received for live domestic rights adds up to £3 billion (or £1 billion a year), which represents an amazing 70% rise over the current £1.8 billion. That’s not the end of the story for the TV gravy train, as the BBC has also paid £180 million for highlights (a comparatively minor 4.5% increase on the current £172 million), producing a total of £3.2 billion for domestic rights. On top of that, there is the money for overseas rights, which is currently worth £1.4 billion. Assuming some reasonable growth, a figure of £2 billion is not out of the question for the next deal, which would mean a total of £5.2 billion for the next cycle, i.e. a mighty £1.7 billion a year. Even that figure does not include the money received for near-live, on-demand and internet clips, but that’s relatively small – at least in the context of the mega deals for live matches. Although Scudamore employed typical English understatement when he described the latest deal as a “decent commercial increase”, the reality is that this is the envy of the world. While he may give the appearance of an arrogant blowhard, there is no doubt that Scudamore is a master of the deal. In fact, the growth in the Premier League’s TV rights is quite staggering, if you consider that the original domestic rights sold for less than £50 million a season back in 1992, while the latest contract brings in more than a billion. Much of the growth is due to more games being televised. This amounted to a meagre 60 in the early days of the Sky revolution, but is now up to 154 in the latest deal, a 12% increase from the current 138. However, that does not explain all of the growth – far from it. Perhaps the best way of highlighting the magnitude of the increase is to look at the amount paid per game, which has increased from the current £4.3 million to £6.5 million, working out to an astounding £73,000 per minute. Looked at another way, the £637,000 per match in the first Sky contract would pay for less than nine minutes at today’s rates. The Premier League’s next rabbit out of the hat should be the sale of overseas rights, which will only be concluded in a few months. Deloitte think that these might go for even more than the domestic rights, which would imply them more than doubling from £1.4 billion to £3 billion. Scudamore himself noted, “I can see several chairmen saying, 'You’ve got 70% more on the domestic deals and we want the same from international’”, which would mean £2.4 billion from overseas rights. My expectation is that there will certainly be an increase in some territories, notably North America, the Middle East and Asia, but I’m going to be more conservative in my calculations and go for an increase of around 40% to £2 billion (£667 million a season) for the rest of this analysis. Many had believed that the value of the domestic rights had reached saturation point, as they had hardly grown at all in the last 2010-13 cycle, when overseas rights had driven virtually all of the increase (£0.8 billion of the £0.9 billion growth). This had resulted in overseas rights accounting for 42% of the total TV money, up from just 11% in 2000. This might not seem to be significant in the wider scheme of things (after all, who cares where the money comes from? ), but it is important to smaller Premier League clubs, as overseas rights are distributed equally in contrast to the methodology used for domestic rights. 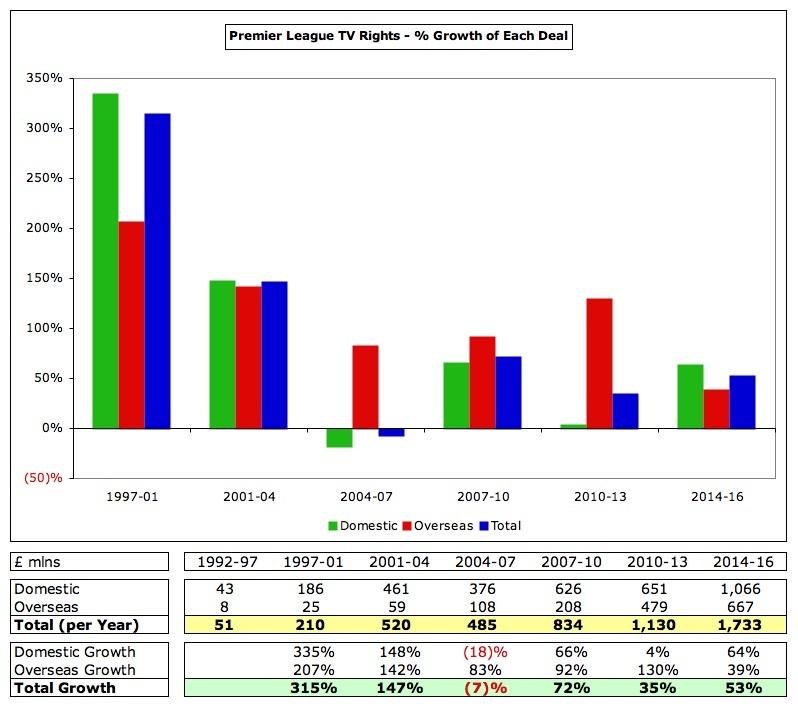 Indeed, if you look at the trend in TV rights since the formation of the Premier League, it is overseas fans that have been behind the explosive growth with the revenue more or less doubling each time that the rights are re-negotiated. Per season, that works out to 2001-04 £59 million, 2004-07 £108 million, 2007-10 £208 million and 2010-13 £479 million. In contrast, domestic rights have stuttered, falling 18% in 2004-07 before surging 66% in 2007-10, then rising only 4% in 2010-13 before the latest 64% increase. 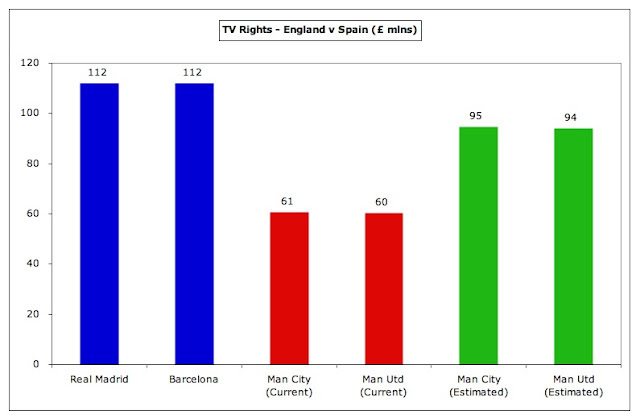 Please note that the widely quoted 70% increase in domestic rights only refers to the live matches. Once the domestic highlights are also included, the total increase equates to 64%. This massive rise is partly due to the tried and trusted economic law of supply and demand, as the previous tender process was effectively a two-horse race, only featuring Sky and a weak Setanta, while this time round there was much more meaningful competition for Murdoch’s empire with BT, ESPN and the threat of moneybags Al-Jazeera entering the race. Of all people, Sir Alex Ferguson was one to argue that the rights to live football had been under-sold, when he suggested that broadcasters should pay more, “I don’t think we get enough money.” Even that wily old fox must have been impressed by the new domestic agreement, which is 25 times as much as the first Sky deal. 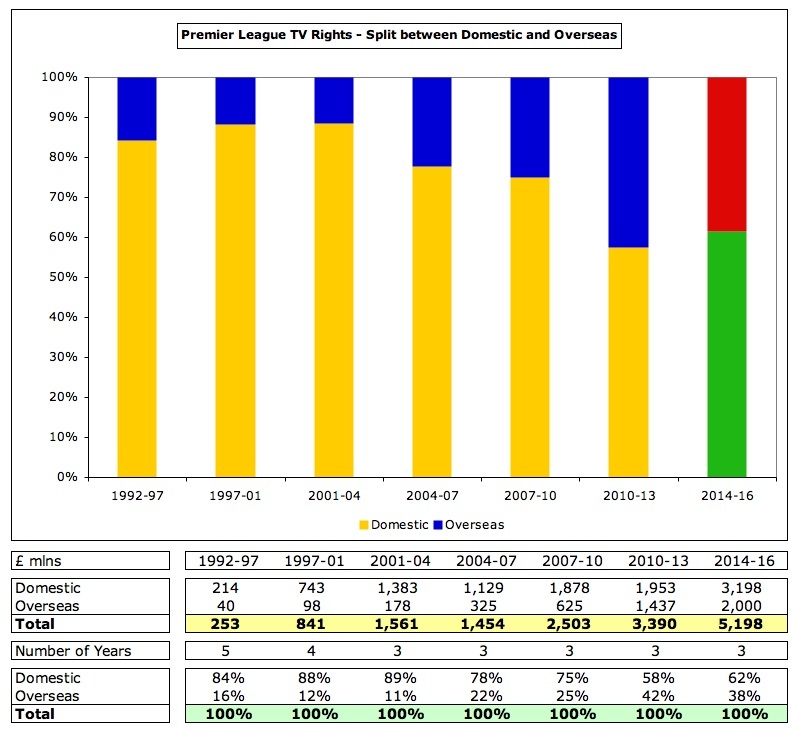 In fact, assuming the overseas rights are sold for £2 billion, the overall TV rights have risen an incredible 3,300% in the 22 years since the Premier League came to pass. 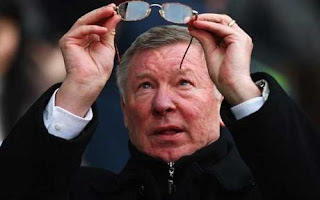 "Sir Alex Ferguson - media visionary"
However, every silver lining has a cloud and other clubs are likely to suffer, notably those in the Championship, as the revenue gap to the top flight further widens. Other sports might also be hit, as their television budgets are cut in order to fund the higher bill for football. Similarly, Sky subscribers may well be confronted by price rises. In theory, clubs might soften that blow by using part of their new riches to reduce ticket prices, but I wouldn’t hold your breath on that one. There are also question marks over how big a slice of the pie will be allocated to developing grass roots football and the national team. 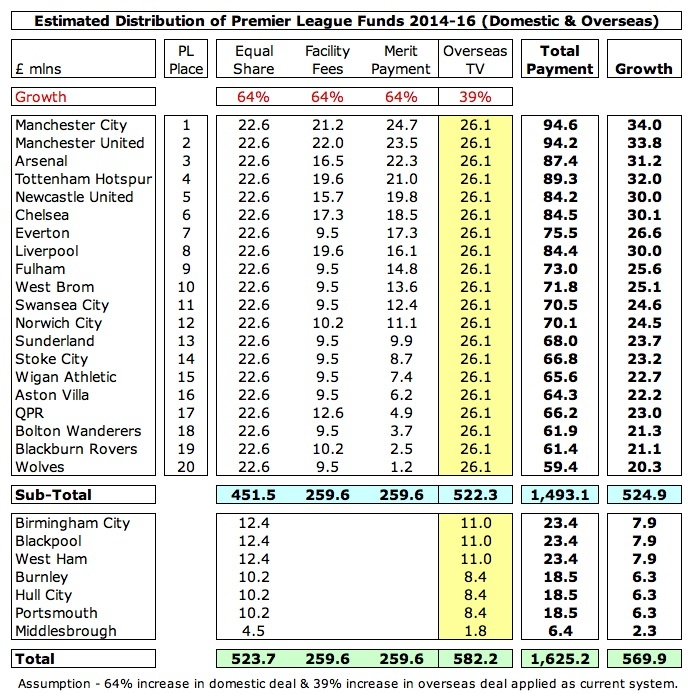 The smart money has to be on the Premier League clubs taking the vast majority of this windfall, as is the case with the current distribution of the league’s revenue. As it stands, a great deal of the TV money is shared equally: 50% of the domestic rights, which is worth £13.8 million to each club, and 100% of the overseas rights, worth £17.9 million to each club. However, 50% of the domestic rights are allocated in a way that does favour the leading clubs. For these funds, 25% is for merit payments, determined by the club’s final league position with each place worth an additional £757,000; and 25% is paid in facility fees, based on how often a club is shown live on television, which benefits the top clubs that are broadcast more often. Nevertheless, the ratio from top to bottom earning clubs in terms of TV payments is much smaller in the Premier League at 1.6 compared to other leagues: Germany 2.0, France 3.5, Italy 4.2 and (most obviously) Spain 10.8. In this way, the top club in 2011/12 (Manchester City) earned £60.6 million, compared to £39.1 million for the bottom club (Wolverhampton Wanderers). In other words, if it ain’t broke, don’t fix it. 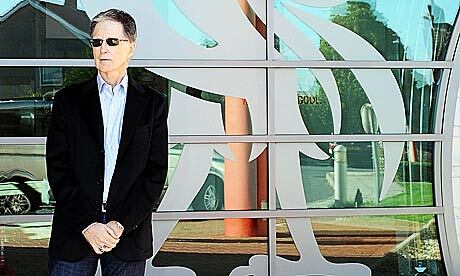 Taking Scudamore’s lead, we can fairly safely assume that the future deal will be treated the same way as now. If we apply the overall 64% increase in the domestic rights to that methodology, we can see that the bottom club’s revenue would be increased by £13 million to £52 million, while the top club’s revenue would grow by £26.7 million to £87.3 million. This is broadly in line with Scudamore’s guidance that each club’s revenue would be at least £14 million higher, but I’m guessing that he simply applied the 70% increase for the live UK rights to get his (slightly lower) figure. Many have written that the new contract would mean that the bottom club in 2013/14 would receive as much as the top club now (£60.6 million), but we can see that this is not quite the case. It should be noted that even if the percentage increase is the same for all clubs, the absolute increase would be larger for the leading clubs. 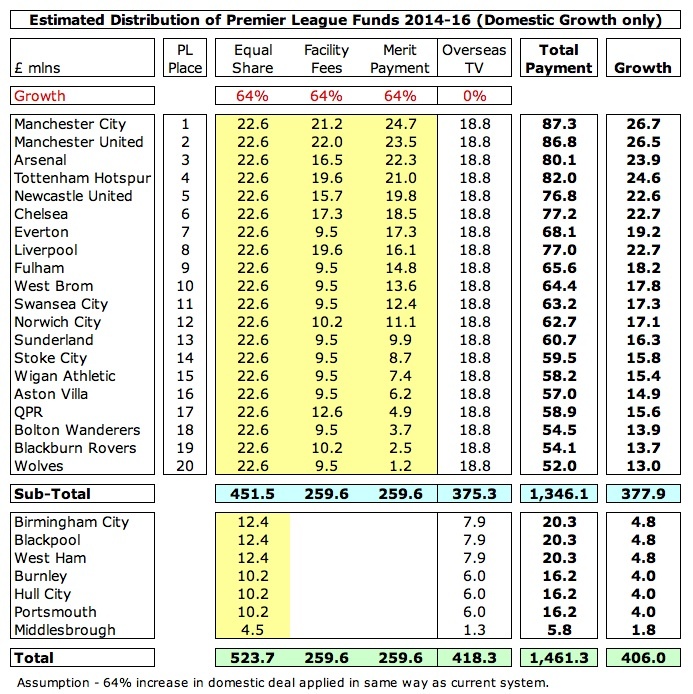 So, even in the Premier League, the gap would widen between clubs: in 2011/12 the difference between top and bottom is £21.5 million, which would grow to £35.2 million in 2013/14. If we continue with this logic for the overseas rights, which we have assumed will rise 39% to £2 billion, then the total increase in revenue would be even more: £34 million for the top club to £94.6 million, £20.3 million for the bottom club to £59.4 million. 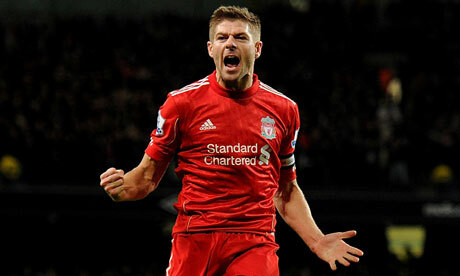 Due to the equal allocation of overseas rights, the gap between top and bottom would still be £35.2 million. 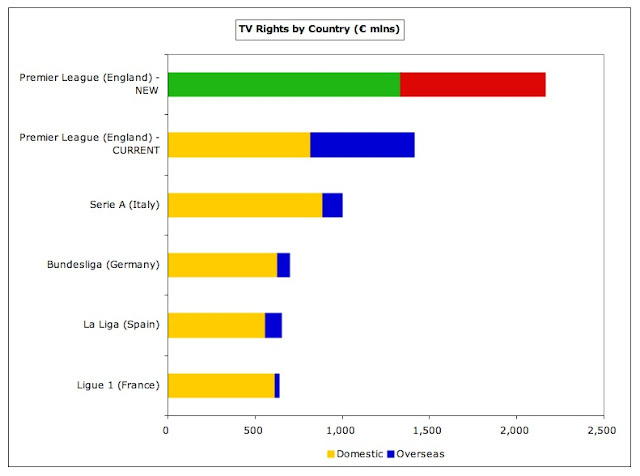 Of course, if the overseas rights come in at a higher figure, e.g. growing by the same amount (70%) as the UK live rights, then the sums would be even higher with the top club earning around £100 million and the bottom club receiving £65 million. The Premier League was already comfortably the richest domestic league in terms of TV deals, but it is now miles ahead of its peers. At an exchange rate of 1.25, the Premier League deal will grow from €1.4 billion a year to €2.2 billion, which is more than twice as much as Serie A’s €1 billion and around three times as much the other leading leagues: Bundesliga €700 million, La Liga €655 million and Ligue Un €642 million. The principal reason for the disparity is the overseas rights, which are currently worth €0.6 billion a year in England (projected to grow to €0.8 billion), but are negligible everywhere else. Some leagues have also managed to increase their TV deals, notably the Bundesliga, where the domestic deal for the four years through 2017 rose 52% from €410 million to €628 million and the overseas rights increased by the same rate to €72 million. The Bundesliga’s chief executive, Christian Seifert, was ecstatic, “ We didn’t expect results like this, it clearly exceeded our expectations”, but it paled into insignificance next to the Premier League. Italy’s TV rights have also been growing since they returned to collective bargaining, but others have not been so fortunate. The French league’s new four-year domestic deal of €610 million with Qatar-backed Al-Jazeera is lower than the current €668 million, though their president considered this to be “more than satisfactory in the current economic climate.” In the same vein, the Scottish Premier League extended their agreement with Sky/ESPN until the 2016/17 season for a combined £16 million year, an increase of just £3 million on the existing deal – and even that depends on four Old Firm matches a season, which must be under threat due to Rangers’ current crisis. 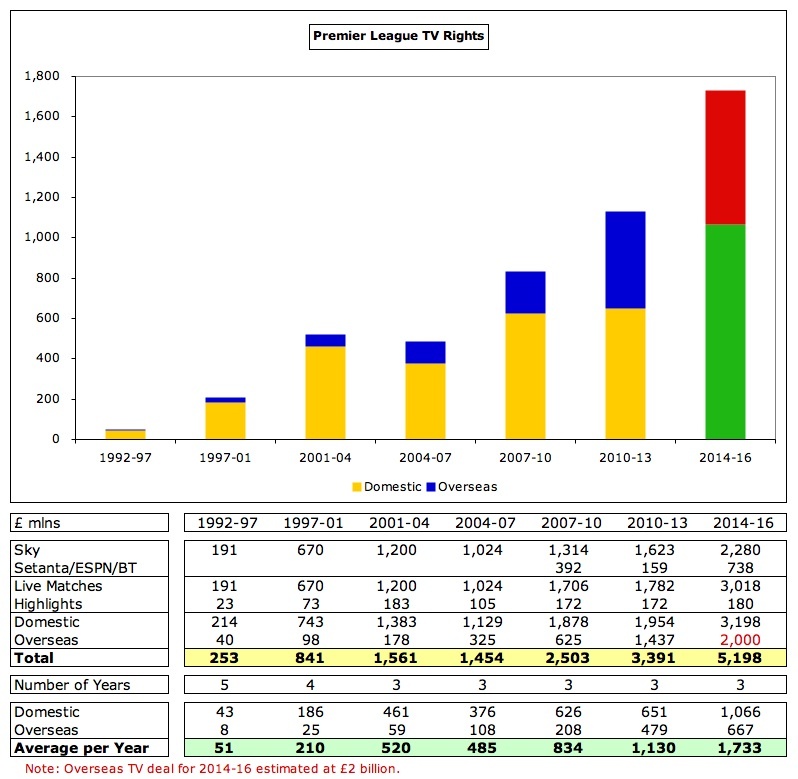 The rise in the Premier League’s TV rights has been so impressive that on its own its estimated €2.2 billion will be higher than the TOTAL revenue of every other league: Bundesliga €1.746 billion, La Liga €1.718 billion, Serie A €1.553 billion and Ligue Un €1,040 billion. As yet another comparison, it is also higher than TV rights for the Champions League (£0.9 billion), the European Championships (£0.7 billion) and the World Cup (£1.5 billion), though obviously they feature far fewer matches. The impact on individual clubs will be striking. Everyone knows that Real Madrid and Barcelona benefit from their individual TV deals in La Liga, which last season amounted to £112 million (€140 million) each. This was getting on for twice as much as the £60 million earned by England’s top two clubs, Manchester City and Manchester United, but the gap will close with the new deal, as I am estimating that this will increase to around £95 million. There is no doubt that this TV deal will improve the competitive position of English clubs. The last Money League produced by Deloitte had Manchester United in an impressive third position with £331 million revenue, but this was significantly lower than Real Madrid £433 million and Barcelona £407 million, but ceteris paribus this shortfall would be almost entirely eradicated by a combination of the extra TV money and the change in the exchange rate (as the Pound has strengthened from 1.11 to 1.25 Euros). As a result of these changes, Madrid would still lead the pack with £384 million, but United’s revised £365 million would overtake Barcelona’s £361 million. Similarly, Arsenal and Chelsea, whose revenue would rise to just under £260 million, would be more or less the same level as Bayern Munich, despite the new German TV deal giving them £10 million more a season. What will be interesting is to see whether this influx of new money into the Premier League changes clubs’ attitudes to European competition. Over the last two seasons, the four English clubs in the Champions League have earned on average around £32 million a season, though that has been boosted by Chelsea winning the trophy in 2011/12 and Manchester United reaching the final in 2010/11. Next season’s new Champions League TV deal is reportedly worth an additional 21%, taking the average up to just under £40 million, so this is still worth getting excited about, especially if we add in gate receipts and higher payments from sponsors. However, the Europa League becomes an even less attractive proposition, paying out around £5 million, so English clubs might take it even less seriously than before. The Champions League would still be a game changer, assuming that the Premier League payments remain reasonably equitable in nature, as can be seen by the graph above, which clearly shows the financial importance of Europe’s flagship tournament at the margin. At the other end of the spectrum, the impact on clubs in the Championship should not be underestimated. 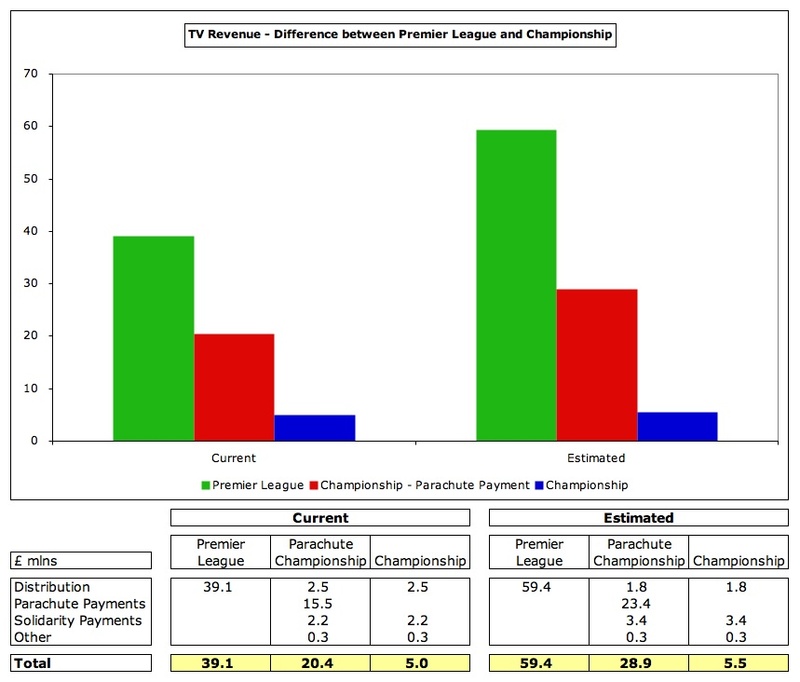 There is already a sizeable gap in the TV revenue between England’s top two divisions, with most Championship clubs earning around £5 million a season, largely comprising a £2.5 million payment from the Football League and a £2.2 million payment from those generous folks at the Premier League, compared to the bottom club in the Premier League’s £39 million. Those clubs relegated from the top flight also benefit from parachute payments of £16 million. Notwithstanding his elusive response, we can probably assume that the overall (estimated) 53% in TV rights would also be applied to solidarity payments, which would increase to £3.4 million, and parachute payments, up to £23 million. Unfortunately, the new Football League three-year Sky TV deal that kicks off in the 2012/13 season will be £69 million lower than the current contract at £195 million, which means a reduction of 26% (or £23 million) a season. This reflected what Football League chairman Greg Clarke called, “a challenging climate in which to negotiate television rights.” That would imply a reduction in the Football League distribution to £1.8 million. So, from 2013/14 the majority of Championship clubs would receive £5.5 million, a thumping great £54 million lower than the bottom club in the Premier League. Even those clubs benefiting from a higher parachute payment would only get £29 million, though this would be more than five times as much as a “normal” Championship club. This runs the risk of creating a closed shop featuring the 20 in the top flight plus 5-6 yo-yo clubs. The dangers for clubs in England’s second flight are obvious, as the urge to spend beyond their means might become unbearable, given that the size of the prize following promotion is even larger than before. 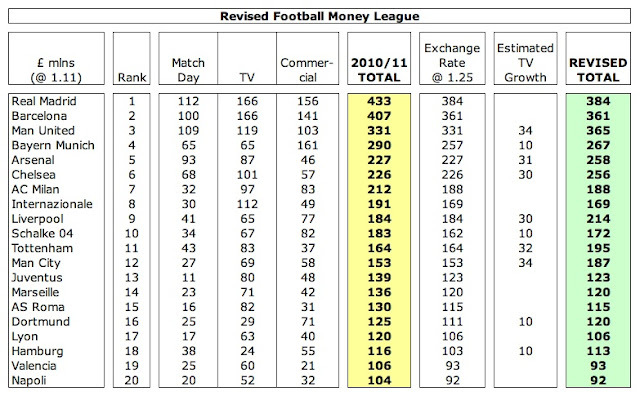 Although this should be restrained by the implementation of Financial Fair Play regulations in the Championship from the 2012/13 season, they will be squeezed by the contrary impact of wage inflation trickling down from the top tier. TV money is critically important to their prospects. In 2010/11 television accounted for a staggering 70% or more of revenue at clubs like Wigan Athletic, Blackburn Rovers, Bolton Wanderers and West Bromwich Albion. Without this money, these clubs simply wouldn’t be able to compete and might even struggle to survive. 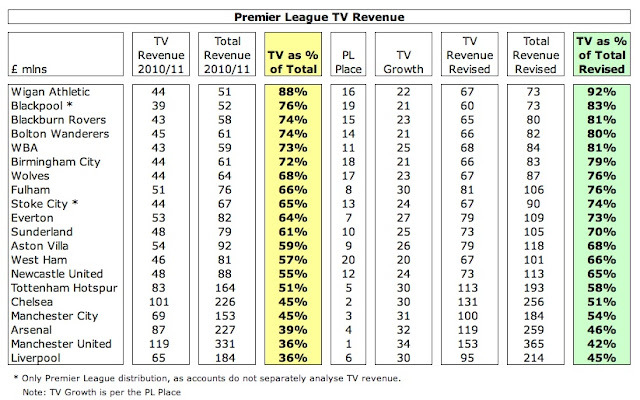 The new television deal brings more clubs into that category with over half of the Premier League earning more than 70% from this revenue stream. At the extreme, Wigan would earn an almost unbelievable 92% of their total income from TV in future – they might as well let fans into the stadium for free, especially as they will be constantly messed about over kick-off times to suit television schedules. As the old saying goes, he who pays the piper calls the tune. So these clubs will also be tempted to splash the cash in order to avoid the nightmare scenario of relegation. Parachute payments might cushion the impact, but it’s still a fearsome drop in revenue. Even those clubs with the foresight to include relegation clauses in their players’ wage contracts would suffer. Very few things are certain in life, but it’s a fairly safe bet that the majority of the additional TV money will simply flow into players’ bank accounts. 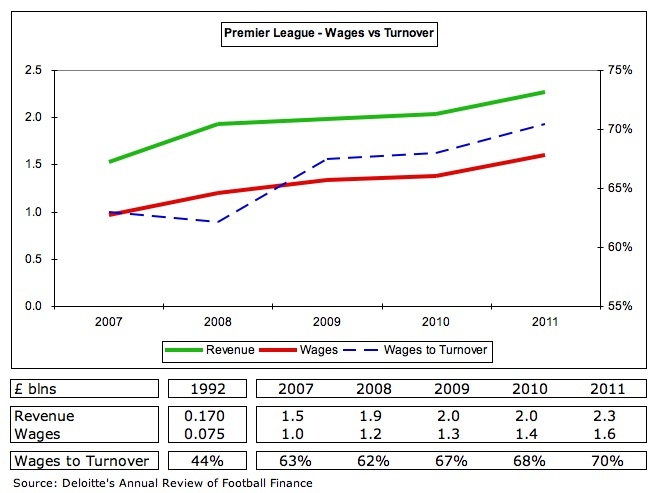 Since 2007 total Premier League revenue has grown 48% from £1.5 billion to £2.3 billion, but wages have increased at an even faster rate by 66% from £1 billion to £1.6 billion. In other words, 86% of the revenue growth of £740 million has simply fueled an increase in the wage bill of £640 million. The important wages to turnover ratio has steadily risen from around 60% to a record 70% in 2010/11. To put that into context, this ratio was only 44% in 1992, the season before the advent of the Premier League, when revenue was £170 million and wages £75 million. Even Scudamore was moved to comment on this danger, albeit as a secondary objective, “Priority number one is retain and attract top talent, but there ought to be a way of doing that while achieving sustainability. Some of it ought to be used to reduce losses.” The more cynical among you would undoubtedly argue that we’ve heard it all before, but there are some signs of a more sober approach taking hold, as eight Premier League clubs reported a profit in 2010/11. That might not be the most compelling endorsement, but it is twice the number of clubs that were profitable the season before. Of course, the Premier League could address this issue full on, if they were to amend their current approach of distributing the vast majority of their revenue to the Premier League clubs. 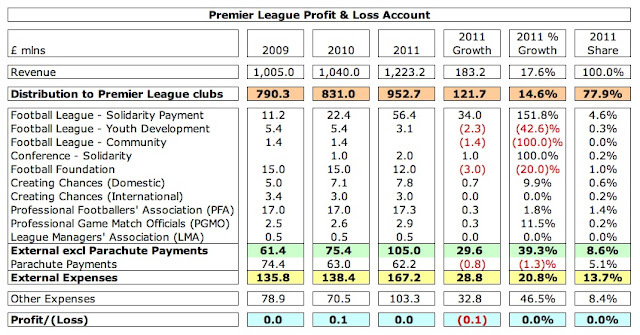 In 2010/11 nearly 80% (£953 million) of their total revenue of £1.2 billion was allocated to the clubs with only 8.6% (£105 million) in external payments, which is frankly derisory. The Premier League argue that 14% (£167 million) of their money goes in external payments, but this includes £62 million of parachute payments, which seems a little disingenuous, not least because it could be argued that this exacerbates the problems for other Championship clubs. 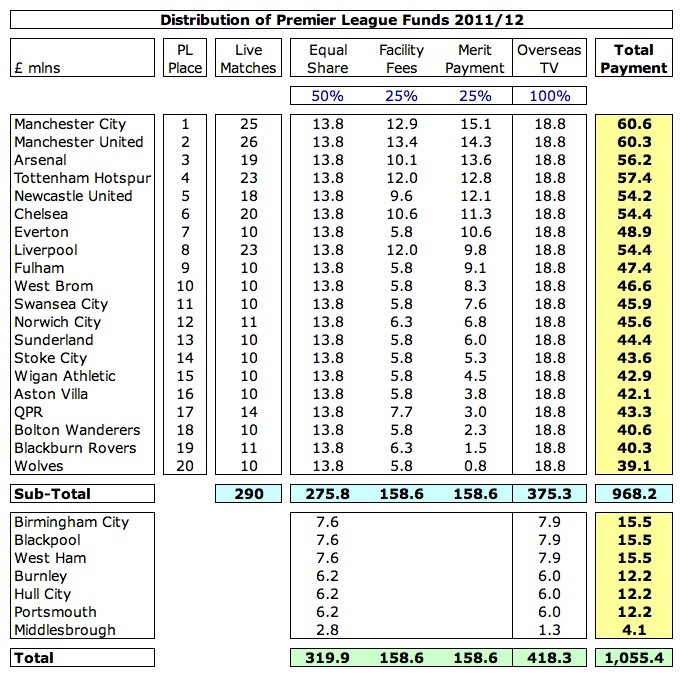 In fairness, the Premier League has given more money in the last few years with solidarity payments to the Football League doubling from £11.2 million in 2008/09 to £22.4 million in 2009/10, and then rising again to £56.4 million in 2010/11. 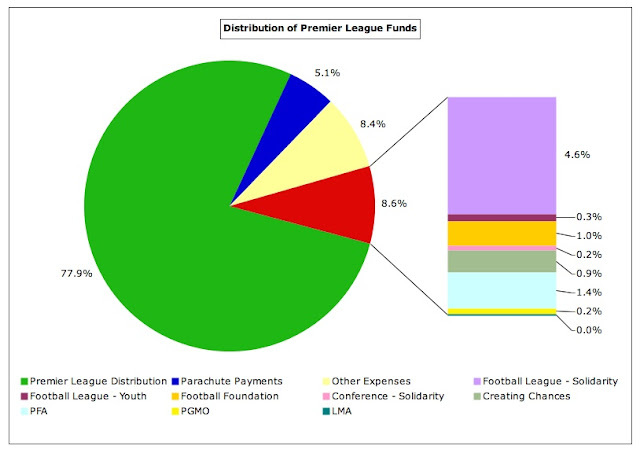 Other external payments include £12 million to the Football Foundation, £10.8 million to the Creating Chances programme, £17.3 million to the Professional Footballers’ Association, £2.9 million to Professional Game Match Officials, £0.5 million to the League Managers’ Association, £3.1 million to Football League youth development and £2 million to the Conference. In this way, the Premier League have described themselves as the most redistributive league in Europe, but as we have seen, they are also by far the wealthiest. The feeling is that the solidarity payments are little more than the scraps from a rich man’s table and that the Premier League could (and should) do more. Thanks to their supreme negotiating skills, the opportunity is now there in spades to do exactly that, but it would be a brave man that gambled money on this happening. Some of the additional money could also be used to boost the prospects of the national team, which older readers will remember was one of the original objectives behind the creation of the Premier League. That has not exactly worked out very well, considering the contrasting fortunes of the league with England’s brave lions. The Premier League has already budgeted £300 million for the Elite Performance Player System (EPPP), the new approach to developing youth players at club academies, but this is deeply unpopular with clubs in the lower leagues, as it takes away another source of income for them. Sir Trevor Brooking, the FA’s director of football development, says that the number of English players in the Premier League needs to double to 60-70% (like Spain), but the worry is that the greater spending power from the TV deal will only encourage clubs to seek instant gratification by acquiring the top talent from abroad. This is partly addressed by the Premier League’s homegrown player rule, but it is still a possibility. 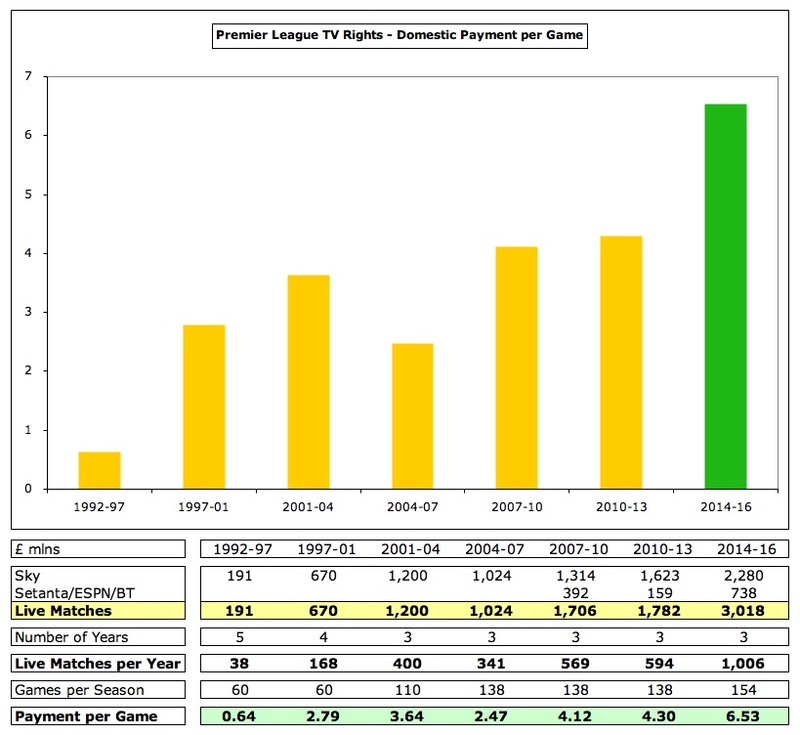 "It's a whole new ball game"
It should be pointed out that the first monitoring period covers the two years 2011/12 and 2012/13, but the increased TV revenue only starts the following season in 2013/14, so this is not an immediate answer to any problems a club might have with FFP. That said, it will help them point towards their finances improving, which is an element taken into consideration by UEFA when reviewing a club’s finances. 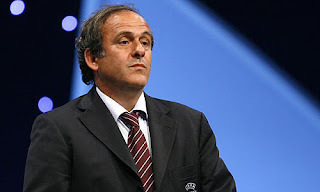 "Platini - delighted at boost to English clubs' FFP prospects"
During the 20 years of the booming Premier League, ticket prices have risen by a gut-wrenching 1,100%, effectively pricing out those on lower income and youngsters. Although the stadiums are still largely full, football’s spectators have become a far more corporate, middle class group, moving ever further away from the community spirit still seen in Germany, where ticket prices are considerably lower. At best, the new TV deal might prevent ticket price rises, which was a genuine possibility as an unfortunate side effect of FFP. What I would like to see is the Premier League allocate a portion of the money on the condition that it is used to subsidise a proportion of tickets, especially those made available to young people. To put that into terms that the marketing men will understand, this would be an investment in future customers. This raises the question of why the bids from the TV companies were so high? Scudamore answered this, “It was a very competitive process, which if you are selling is a very good thing.” As well as Sky, BT and ESPN duking it out, there was the threat of Al-Jazeera hanging over the proceedings, while one of the terrestrial channels (ITV or Channel 5) may have bid for one of the packages. Even Google and Apple were mentioned in dispatches at one stage. Whoever did actually bid, there were enough “highly credible bidders”, as Scudamore described them, to encourage Sky to step up to the plate and substantially raise their bid. It was imperative for Sky’s business model that they kept the TV rights. They simply cannot afford to lose live football, which is so vital to their revenue. Before they secured the rights in 1992, when they were famously urged by then Tottenham chairman Alan Sugar to blow ITV’s bid “out of the water”, they were really struggling and looked like they might go the way of the defunct BSB. Since then, it’s been a “whole new ball game”, but Sky are now largely prisoners of their own success, as the name of the game now is to keep other broadcasters away form their prize asset. No wonder Sky chief executive Jeremy Darroch was so relieved that “Sky Sports remains the home of Premier League football” with Super Sunday and Monday Night Football. Financially, the deal could still make sense for them, as they earn revenue not just from subscribers, but also from pub licences, advertising and a hefty sponsorship deal with Ford. They are also likely to offset much of the football increase by reducing their spend on other sports, which could be bad news for rugby and cricket. 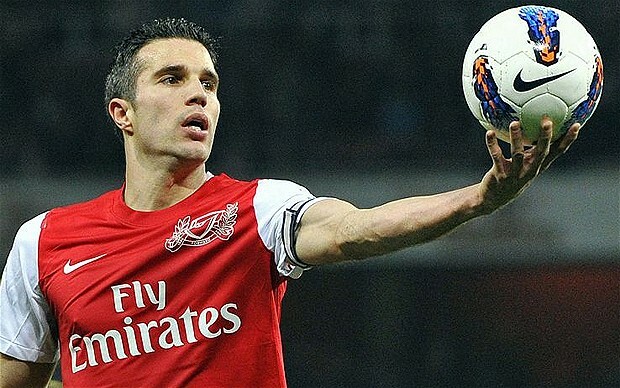 The financial possibilities offered by the Premier League is the main reason for the arrival of so many foreign owners, especially from America, e.g. the Glazers, Stan Kroenke, John W Henry and Randy Lerner. 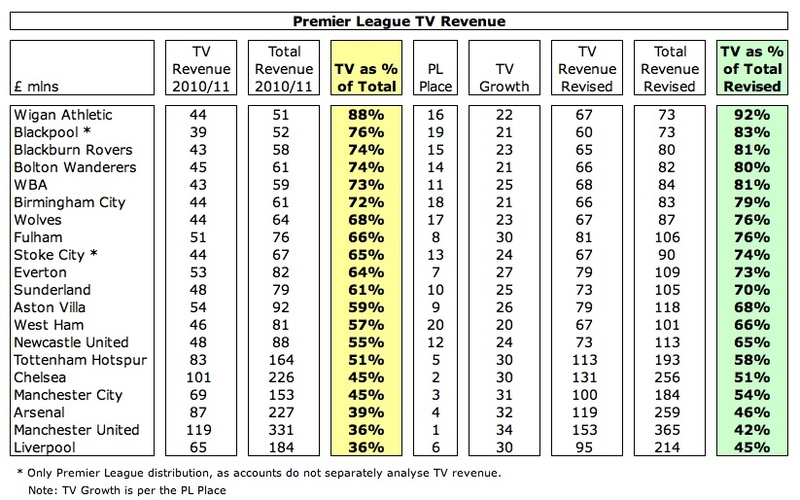 In contrast to sports franchises in the US, where they have to share all revenue received, including TV money, gate receipts and merchandising, in the Premier League they keep the vast majority of revenue earned. The other attractive aspect of the Premier League for American investors is its global appeal, which again is not something enjoyed by sports like baseball, basketball and American football. 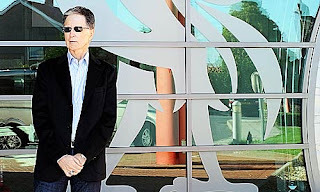 "John W Henry - the future's so bright, I gotta wear shades"
It is equally clear that foreign owners see great promise in online delivery, hence Stan Kroenke’s purchase of a 50% share in Arsenal Broadband long before he launched his takeover bid for the whole club. Indeed, the emergence of fast broadband networks might be the catalyst for clubs to launch their own channels to interact directly with their fans, though advances in technology could also provide a threat to revenue (via illegal internet streaming). The other major threat to football’s huge TV revenue is regulatory, e.g. a pub landlady in Portsmouth won a case to allow her to use cheaper foreign satellite television services to watch Premier League football. However, to date the Premier League has proved very adroit at finding creative solutions to such challenges, so it would not be a great surprise if it found a way to maintain (or even grow) its revenue, e.g. selling rights on a pan-European basis. In the US, the huge new TV deals for the major sports have been attributed partly to the fact sports is the last "Tivo/DVR/PVR"-proof television product, the last one people need to see live. 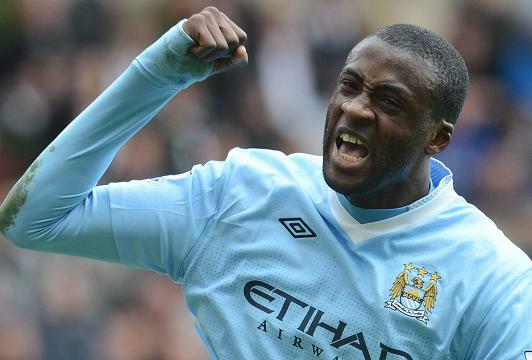 Do you think that's part of the factor in the Premier League's vast increase? Yes, I think that's absolutely correct. Very few "products" possess that quality. One area that I didn't explore in this piece, but did in my last one on UEFA's finances is the huge sums paid for American sport, such as the NFL, which possibly point the way forward for TV rights. Of course, one big question for the future is how this will be affected by technology. Not sure that anyone knows the answer to that one. MLS might adopt UEFA financial fair play in the near future. It might look like this if it gets the approval of 2/3 majority of owners. In addition, there will be significant revenue sharing in which high-revenue MLS clubs helping the low-revenue MLS clubs financially. This is an incentive to get more low-revenue clubs on board (need 2/3 majority to pass or 13 out of 19 clubs). Right now in MLS, a club that generate $50 million in revenue a year are kept back at the same level as a $10 mil revenue club due to the $2.5 million hard salary cap (DPs cost $350,000 toward the cap). Have a link to FB on site, love the articles and want friends to be better educated in this side of football, take a bow son, take a bow. Why have you repeated the myth that the SPL TV deal depends on 4 old firm games a season? Fantastic piece! On the technology front, I think this is where US Sports have been ahead of the Premier League and UEFA in utilising New Media, and despite the big increase in the new deal, it actually had potential to grow even more. Online video rights (currently sold as just highlight reels) still make a very small proportion of the rights. The next round of bidding will be very interesting if rumours hold true, the likes of Google/Apple getting a piece of the pie could blow Sky off the water. Bloody hell, can some explain in less than 50 words? Seriously excellent, an outstanding blog. I'm so excited for this money to result in decreased ticket prices and not exorbitant wage & transfers! For example, at the moment, Everton are paying c£5m per annum in interest payments on their debt. This TV deal will more than cover this, and hopefully make them financially stable again....Heres hoping!! In addition to the coming Overseas Rights, the most interesting thing to keep an eye on for EPL fans will be what is touched on in the section on Real Madrid and Barcelona. It does sound like the pressure in La Liga is reaching that same threshold that it did in Serie A where the Big Clubs had to knuckle under to the other clubs in terms of revenue split. Recalling your pieces on Juve and Inter, that had a decent impact on their revenues. (b) applying an estimate to that reduction to RM & Barca's tv revenue, where do you think they would end up relative to the top EPL teams relative to the new tv deal? Otherwise excellent article. 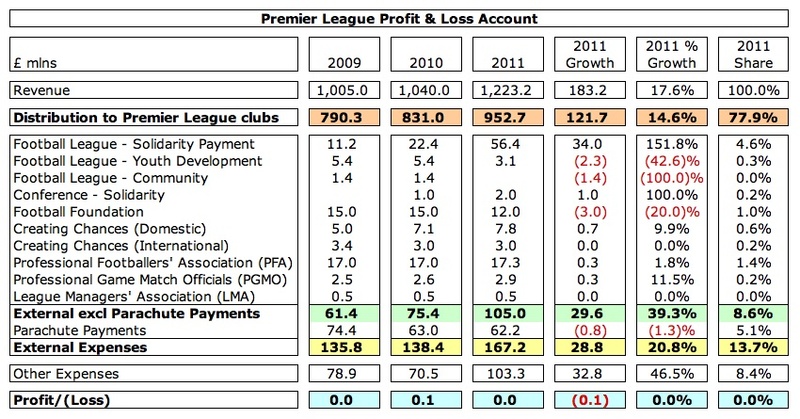 Is there any reason why the League cannot give money to clubs on condition they spend it in a certain way e.g. ticket price initiatives? The collective deal in Serie A didn't really hurt the big clubs, they're pretty much earning the same amount from the league because the deal was so much larger than the total of all previous individual rights. The main problem was a huge dent in commercial revenues due 2006 scandal, and/or falling out of the CLs (esp. the case for Juve, they had a huge commercial deal about 5/6 years ago before relegation). Collective deals actually bring in more money in total as there is more value in centralising rights. My guess is a much larger total amount for collective rights together with skewing distribution will mean Real and Barca won't lose out too much, plus both have massive commercial revenues and membership fees. Swiss: Thanks for the response. I probably wasn't clear. In the past, the growth of the deal would mostly have gone into the pockets of the Serie A Big Clubs. 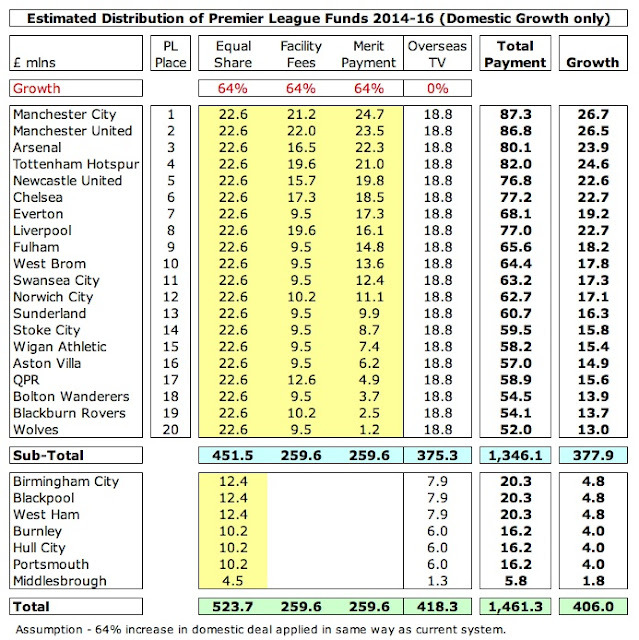 With the newer deal, the growth largely balanced out the give back to the smaller clubs. Long term, there will be normal growth for all if TV money continues to go up. I was thinking in terms of La Liga in the same way. RM and Barca look at the EPL tv deal and dream of their own tv revenue going up 60% in their next contract. Instead, the growth of Spanish TV money will go largely to balance out the have/have not ratio. In contrast to the EPL where the English Big Clubs will all be getting 60% bumps (assuming overseas deals are similar in boosts). Relative to United, Chelsea and City, Barca's and RM may have flat tv revenue under their new deal while the EPL's skyrockets. I'm with you that they won't lose much because of their other revenue streams. 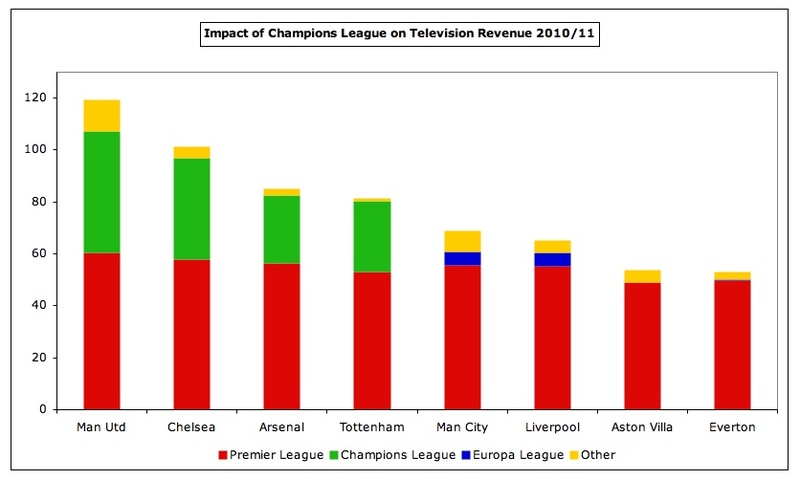 Just that flat Barca & RM TV revenue in this cycle may see United zoom past them. Would seem highly unlikely, with the present state of the Spanish TV market, that RM and Barca wouldn't have to take a revenue cut, absent a new entrant such as Spanish BSkyB or similar foreign domestic entrant. Brilliant article, best I've read in ages. I love how your writing makes the content so entertaining and worth reading. Thanks a lot! Great article, just starting to read through all your earlier articles, keep up the good work! I have just one question: how come Tottenham has more live matches than Arsenal and receives higher facility fees than both Arsenal and Liverpool? Would say the latter two clubs are clearly more established brands. City also isn't as known and well supported as Arsenal or Liverpool, but I can understand them being shown more often live because of their new fortunes, but Tottenham? Please contact the folks at Howler and ask to write for them. Your stuff would be perfect for their long-form magazine, and they could make you pretty graphics too! Is at some point the way forward for each club to sell their matches via a stream (since that's how we'll be getting all our content in a decade)? Or some kind of a-la-carte match purchase directly from the league or the clubs? Out of curiosity, where do you get your data from? Other than the Deloitte Money League, everything I've searched for leads me to your website.